So what’s the deal with Ben Affleck’s tattoo, huh? We know the actor has quite a few, but we are pretty sure that a particular one comes to mind when you hear the words, ‘Ben Affleck’s tattoo’. Well we are going to be exploring the weird back tattoo he got and check out his general body art choices along the way. Although he has a handful of tattoos, the one that has gotten the most media coverage, by far, is his back tattoo. 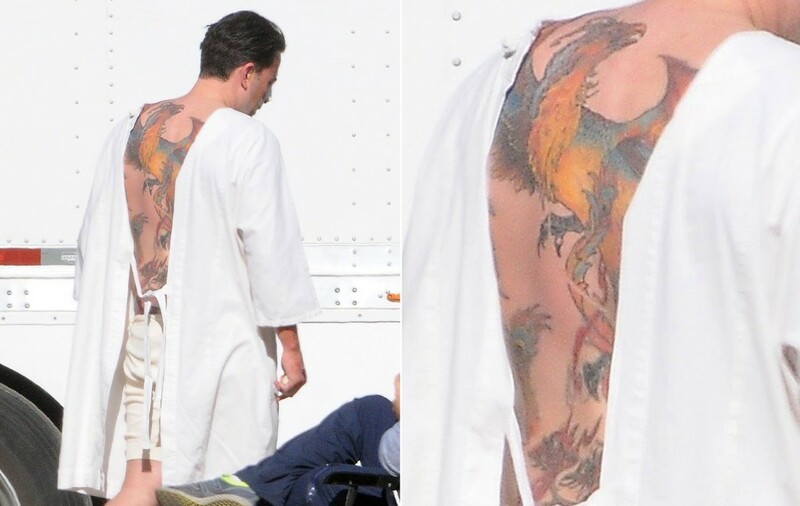 At first glance all the colors may throw you off, but it appears that Ben got a giant phoenix sprawled across his back. Ben Affleck’s tattoo first surfaced after his split with his estranged wife, Jennifer Garner. So, it popped up in December last year and the actor claims that there has not been ‘a good representation of it in the media’, that is why he has refused to show it to the world himself. It certainly made everyone ‘react’, but there are some reactions out there that just had to be noted. His exes, Jennifer Garner and Jennifer Lopez both had a thing or two to say about Ben Affleck’s tattoo. In an issue of Vanity Fair, the actress gave a fitting comment when asked about Ben Affleck’s tattoo, ‘You know what we would say in my hometown about that? Bless his heart. A phoenix rising from the ashes. Am I the ashes in this scenario? I take umbrage. I refuse to be the ashes.’ She clearly does not want any credit, for what is seemingly a sign of his mid life crisis. We are beginning to understand where the actor was coming from when he said there has not been ‘a good representation of it in the media’. Well in a shocking twist, Ben revealed some surprising news about his epic tattoo, In an interview with Extra to promote Batman v. Superman. The photo everyone has seen was actually taken on the set of his film Live By Night, and apparently the tattoo is a fake and was done specifically for that movie. Well, if it is indeed a fake, there are two Jenny’s out there who need to retract their statements or restructure them. Ben fancies himself a tattoo guy, there are some we can see and others we cant’t see (wink), so here’s a quick look through the ones we can actually see, Ben reserves the right to name the others when he is ready. On his right bicep he has barbwire with playing cards, he also has upside down cross with a diamond and spade ace cards with a cross on his left arm. We aren’t done yet, he also has a mysterious tattoo with ‘OV’ on his shoulder blade, MOH NON TE written above it and TA OR underneath it. The general public has no idea what they mean. We reckon that this last one was meant to be ‘unseen’, he has a dolphin on his right waist colored in black ink. The actor fathered three children with his estranged wife during the course of their 10 year marriage. His first daughter, Violet Affleck, was born on December 1, 2005, the same year the couple tied the know by the sea in the Caribbean. It’s no secret that although the estranged couple are slowing it down on their life together, they are both still actively involved in their kid’s lives. On Violet’s 10th birthday last year, they were spotted together going for a ride, most likely putting the finishing touches on the preparations for Violet’s big day. Roughly four years after her sister, Seraphina Rose Elizabeth Affleck was born on January 6, 2009, and after Seraphina came Samuel Garner Affleck on February 27, 2012. The couple are still very involved in their kids lives despite whatever may or may not be going on between them. Some of you may not know this, but there is another Affleck in Hollywood. He may not be as popular as his older brother, but he has quite the impressive portfolio, with him appearing in movies like Goodwill Hunting and the Ocean’s Trilogy. Besides being an actor, Casey Affleck, who was born on August 12, 1975, is also a director, screenwriter, and producer. As a youngster, he ended up doing some odd jobs he worked as an auto mechanic, a carpenter, a bookie, an electrician, a bartender and a janitor at Harvard University. So we can say that the younger Affleck has come a long way.